The current version of the PayPal Express Checkout Payment Gateway asset in Squiz Matrix is using the NVP/SOAP Express Checkout API that has been deprecated by PayPal. Please use a different payment gateway such as Braintree, PayPal Payment, or PayPal Payflow Pro. Development to support the new PayPal Express Checkout API method is currently in progress but not yet available in Squiz Matrix. The PayPal Express Checkout Payment Gateway allows you to create a payment solution for your customers, utilising PayPal's express checkout payment options. Please note that in order to use the PayPal Express Checkout Payment Gateway, you will need a PayPal Business or Premier account, capable of accepting payments via express checkout. Please note that the PayPal Express Checkout online payment gateway posts payment information directly to a remote server. Squiz Matrix does not personally handle any of the sensitive information managed by this payment gateway and is thus exempt from PCI compliance standards. Once you have added a PayPal Express Checkout Payment Gateway, you can configure its settings on its associated asset screens. The majority of these screens are the same or similar to those for a Standard Page and are described in the Asset Screens manual. In this chapter, we will describe the Details and Display Formatting screens, which are different for a PayPal Express Checkout Payment Gateway. The Details screen allows you to configure the settings of the PayPal Express Checkout Payment Gateway. For more information about the Status, Future Status, Thumbnail and Details sections, refer to the Details Screen chapter in the Assets Screens manual. This section allows you to input the credentials of the PayPal API used to process express checkout payments. The PayPal Express Checkout API Credentials section of the Details screen is displayed in the figure below. The fields available in this section are outlined below. The information required for these fields can be obtained when configuring the API on your PayPal account. For more information, refer to the PayPal Developer website. API Username: enter the username of the API configured on your PayPal account to process transactions on the PayPal Express Checkout Payment Gateway. API Password: enter the password of the API configured on your PayPal account to process transactions on the PayPal Express Checkout Payment Gateway. API Signature: enter the signature of the API configured on your PayPal account to process transactions on the PayPal Express Checkout Payment Gateway. This section allows you to configure the general settings of the PayPal Express Checkout Payment Gateway and specify the button to display to users for this payment option. The Gateway Options section of the Details screen is displayed in the figure below. Timeout: select the amount of time in seconds that the payment gateway will wait for the user's response before returning an error. By default, this field is set to 60 seconds. Test Mode: select whether or not to use the payment gateway for testing purposes only. If this field is set to On, as shown in the figure below, the payment gateway will not process any payments. Button Image URL: enter the URL of the image to display for the PayPal Express Checkout Payment Gateway. This button is displayed to users, allowing them to select this payment option while completing their e-commerce order. By default, this field will use the button at the following URL: https://www.paypal.com/en_US/i/btn/btn_xpressCheckout.gif. This section allows you to source address information for use on the confirmation page of the PayPal Express Checkout Payment Gateway. This information is displayed via keyword replacements available on the Display Format Bodycopy. The Pass through Variables section of the Details screen is shown in the figure below. First Name Variable Name: enter the pass through variable key for the first name of the delivery address. Last Name Variable Name: enter the pass through variable key for the last name of the delivery address. Street Variable Name: enter the pass through variable key for the street of the delivery address. City Variable Name: enter the pass through variable key for the city of the delivery address. 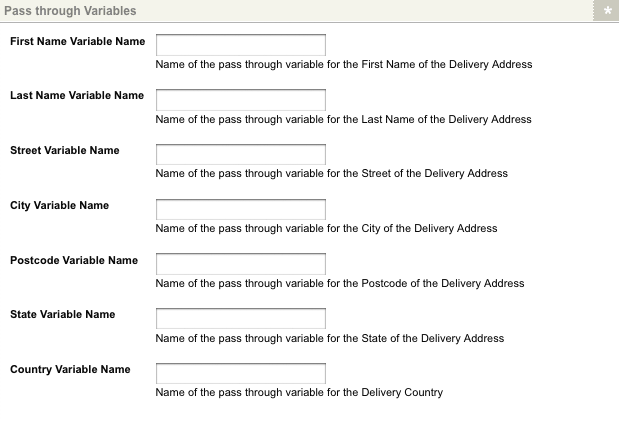 Postcode Variable Name: enter the pass through variable key for the postcode the delivery address. State Variable Name: enter the pass through variable key for the state of the delivery address. Country Variable Name: enter the pass through variable key for the country of the delivery address. The Display Format Bodycopy is used to define the layout of the confirmation page of the PayPal Express Checkout Payment Gateway page, displayed to users when they return to your site after configuring their payment within PayPal. The default layout of the payment gateway is shown in the figure below. By default, the transaction amount on the PayPal Express Checkout Payment Gateway will be listed in dollars. This may need to be changed depending on the currency you have selected on the Details screen. Delivery Address First Name: this will show the customer's first name as specified on the delivery address. Delivery Address Last Name: this will show the customer's last name as specified on the delivery address. Delivery Address Street (Street Number, Name and Type): this will show the customer's street address as specified on the delivery address. Delivery Address City: this will show the customer's city as specified on the delivery address. Delivery Address Postcode: this will show the customer's postcode as specified on the delivery address. Delivery Address Country: this will show the customer's country of residence as specified on the delivery address. A number of these fields are compulsory when creating a working payment gateway. If the required fields are not available to the user, the transaction will not be able to be completed.